The cataclysm is believed to have wiped out the dinosaurs. "This was probably the most important event in the last 100 million years," says Joanna Morgan, a geophysicist at Imperial College in London and a leader of the expedition. Since the 1980s, researchers have known about the impact site, located near the present-day Yucatan Peninsula. Known as Chicxulub, the crater is approximately 125 miles across. It was created when an asteroid the size of Staten Island, N.Y., struck Earth around 66 million years ago. The initial explosion from the impact would have made a nuclear bomb look like a firecracker. The searing heat started wildfires many hundreds of miles away. After that, came an unscheduled winter. Sulfur, ash and debris clouded the sky. Darkness fell and, for a while, Earth was not itself. "I think it was a bad few months, really," Morgan says. That's an understatement: Scientists believe 75 percent of life went extinct during this dark chapter in Earth's history, including the dinosaurs. 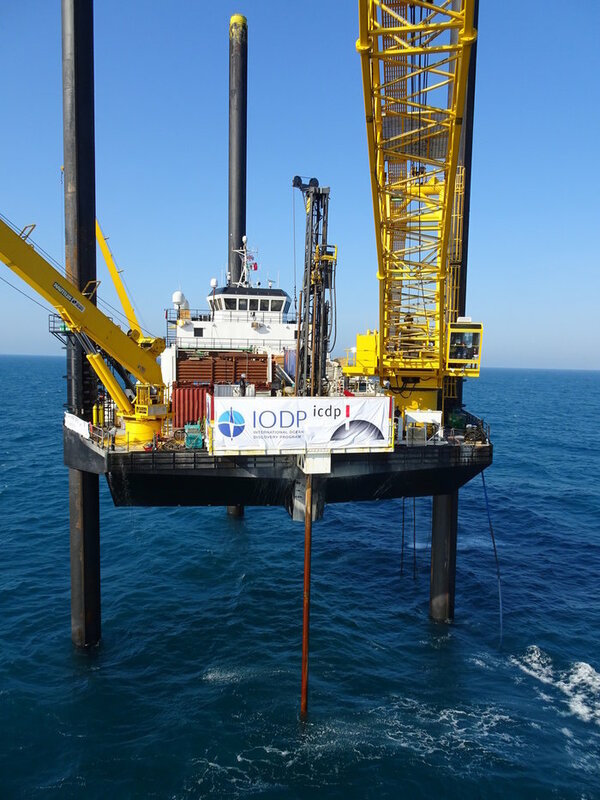 Researchers have sampled Chicxulub before, but this expedition by the European Consortium for Ocean Research Drilling precisely targets a key part of the crater yet to be studied: a ring of mountains left by the asteroid. This "peak ring" is a fundamental feature of the strike and should tell researchers much more about it, says Sean Gulick, a geophysicist at the University of Texas at Austin, who co-leads the team with Morgan. 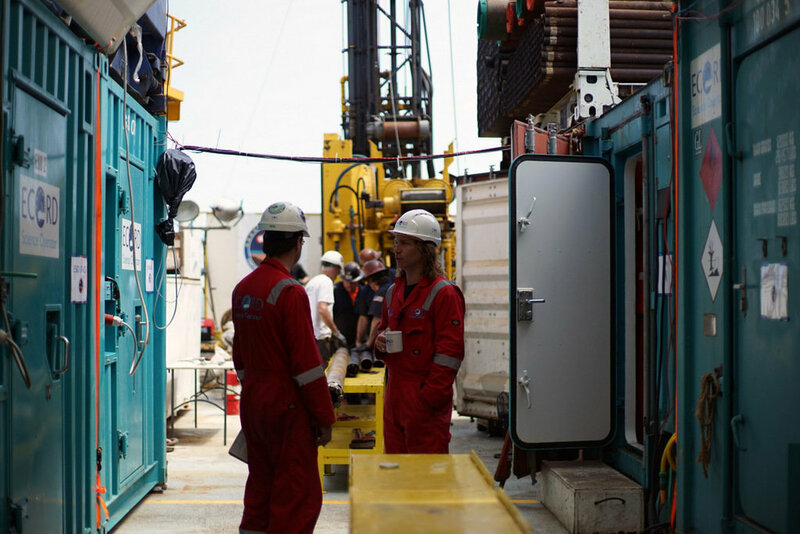 For weeks, they've been drilling — and going back in time. Each layer of rock they pass through is connected to a part of Earth's history. "We went through a remarkable amount of the post-impact world. All the way into the Eocene times — so between 50 and 55 million years ago," Gulick says. The rocks they've pulled out show how life began to recover after the cataclysm, Gulick says. "We've got all these limestones and rocks that contain the fossils from the world after the impact, all the things that evolved from the few organisms that survived." The research team finally reached the top of the peak ring this week. It appears to be a thick layer of broken, melted rock just beneath a layer of sandstone that may be the leavings of a huge tsunami that was triggered when the asteroid struck. Gulick thinks the rocks hold clues. For example, if any microscopic organisms survived near the site of the strike, their fossils might be in these samples. In June, the rock cores will be sent back to a lab in Germany for further study. The asteroid strike marked the end of an era. But the creatures that made it through that catastrophe went on to shape the world again, says Morgan. "The mammals survived," she says. "And that led on to our own evolution."